These hasselback potatoes are perfect for a dinner party or just to impress friends or family. Scrub your potatoes well since you will be leaving the skin on for this recipe. Using a sharp knife, place deep cuts in the potato every 1/4" stopping when your blade hits the chopsticks. Repeat for all potatoes and then place the potatoes on a lined cookie sheet. Melt 1/4 cup butter and 1/4 cup olive oil in a saucepan with the minced garlic and thyme. Brush the melted oil-butter over the potatoes, ensuring you get in as many of those cuts as possible. Bake the potatoes for 30-45 minutes, until golden and crispy. Melt the remaining butter and olive oil with the garlic and thyme. Brush the melted butter-oil mixture on top of the crispy potatoes. Season with salt and pepper and garnish with Parmesan and parsley. 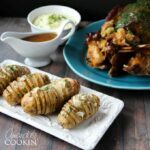 This recipe for Hasselback Potatoes was printed from AmandasCookin.com - https://amandascookin.com/hasselback-potatoes/ and can only be printed for education or personal use.